The term alcohol “misuse” refers to stages 3 and 4 in the pattern of drinking. In these stages, drinking begins to become a problem, and if the individual continues in the same manner, he is adjudged as misusing alcohol. Alcohol misuse has long-term and short-term impacts on all parts of the body. Alcoholic drinks come in various strengths and sizes, so units are the best way to determine whether a person is drinking in moderation or excess. One unit of alcohol is equal to 8 g or 10 ml of pure alcohol. Whether drinking at home or in pubs, it is best to use 25 ml glasses (about 1 unit) to avoid misuse. In addition, bottles or cans that contain the drinks need to be checked for the percentage of ABV (alcohol by volume), before consumption. Drinking about 14 units a week is considered safe; anything beyond this level leads to misuse. The risks of alcohol misuse are based on the normal tolerance levels of the human body. Heavy and dependent drinkers may have higher tolerance levels, and for them the visible effects of alcohol appear later than normal. The following are the short-term risks of alcohol misuse, based on the number of units consumed. Increased heart rate with dilation seen in the blood vessels. Person feels warm and elated, and shows tendencies of becoming talkative. The brain and the nervous system begin to be affected. The area of the brain responsible for decision making and judgment are impacted, contributing to display of rash, unrestrained, and impetuous behavior. Impairment in the cells of the nervous system makes a person experience light-headedness and slow reaction and coordination time. The speech becomes slurred, the vision loses focus, and the reaction time slows down. 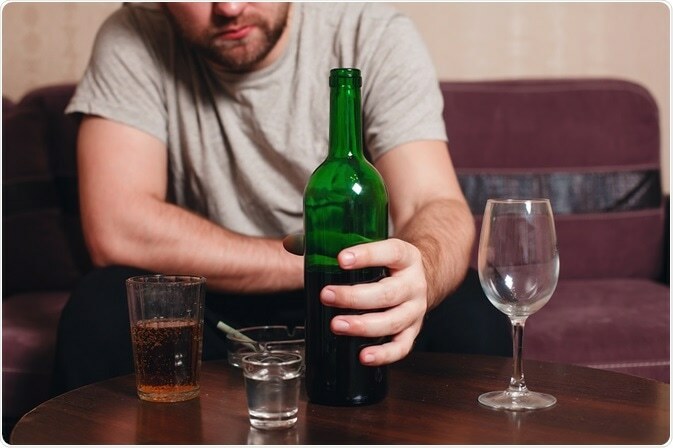 The liver, which requires one hour to clear out alcohol from the body, is unable to do so completely, and so the individual awakes the following morning with a hangover. A hangover is a variety of unpleasant reactions like headache, nausea, fatigue, drowsiness, sweating, dry mouth, anxiety, and general discomfort that can be present for up to 24 hours or more. Increased feeling of drowsiness, depressant effect on the mind and body, and greatly impaired general coordination. The alcohol levels are now toxic, so the body tries to dispel it through urine, resulting in dehydration and causing severe headache. The presence of symptoms of nausea, vomiting, indigestion, and diarrhea indicate the increased effects on the stomach. There is huge risk of alcohol poisoning. Severe cases of alcohol poisoning lead to coma, brain damage, and even death. Misuse of alcohol for many years has repercussions on all parts of the body. Long-term misuse impairs the immune system, increasing vulnerability to serious infections. Regular drinkers are more likely to contract pneumonia and tuberculosis than nondrinkers. There is also bone damage, leading to increased risk of fractures. The final outcome of long-term alcohol misuse is organ damage, with the brain, nervous system, heart, liver, and pancreas undergoing the most damage. Brain risks: Excessive drinking causes shrinkage (brain atrophy) of certain areas of the brain, due to which there is loss of memory and other symptoms related to dementia. There is loss of executive functions like problem solving and decision making. Depression and epilepsy are caused and seizures are also triggered. Some medications like anti-epileptic drugs are hindered in heavy drinkers. Nervous system: Alcohol creates a toxic effect on the nerves, due to which alcoholic neuropathy is caused. In this condition, there is general muscle weakness leading to problems of incontinence, constipation, and sexual dysfunction. Heart risks: The heart muscles are weakened, leading to cardiomyopathy. Alcohol weight gain leads to high blood pressure and stroke. Abnormalities, like atrial and ventricular fibrillation (twitching in the heart chambers), develop blood clots, leading to loss of consciousness and death if emergency treatment is not provided. Liver: Cirrhosis of the liver is a common ailment among alcoholics, though both moderate and heavy drinkers are susceptible to it, for reasons unknown. The liver is constantly exposed to toxins from alcohol and, hence, becomes so scarred that it is unable to function. Liver transplantation remains the only alternative. Pancreas: Alcohol is metabolized by the pancreas, and excess alcohol causes oxidative stress to the gland. About 60% of acute pancreatitis is caused due to alcohol consumption. In this condition, there is intense abdominal pain and frequent diarrhea.